Verma’s Apex Institute is a teacher based institute now shifted at Career Coaching Campus Vinayak City Square (near subhash chauraha) Civil Lines Allahabad. Here star teachers are dedicated and devoted to solve the multidimensional difficulties faced by pre-medical students. Apexian star teachers have atleast 15-20 years teaching experience and provide well planned systematic and scientific efforts to develop confidence because confidence is first stem towards the success. WE HAVE NO ANY BRANCH IN ALLAHABAD. BEWARE OF SIMILAR MISLEADING NAMES. Verma’s Apex Institute is now shifted at Career Coaching Campus Vinayak city square (near subhash chauraha)Civil Lines Allahabad with Fully Air Conditioned classrooms.First target batch for PMT will be started from 9th May 2015. 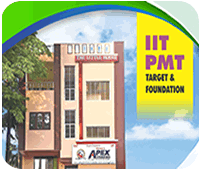 PMT Foundation batches (XI & XII)have already been started. WE HAVE NO ANY BRANCH IN ALLAHABAD. BEWARE OF SIMILAR MISLEADING NAMES. Verma’s Apex Institute is a premier institute of eastern Uttar Pradesh located at Career Coaching Campus Vinayak City Square Civil Lines Allahabad 211001. This is registered under coaching regulation act of Uttar Pradesh (Regn. no. AC 983). The Verma’s Apex Institute prepares the students for pre-medical entrance examinations.